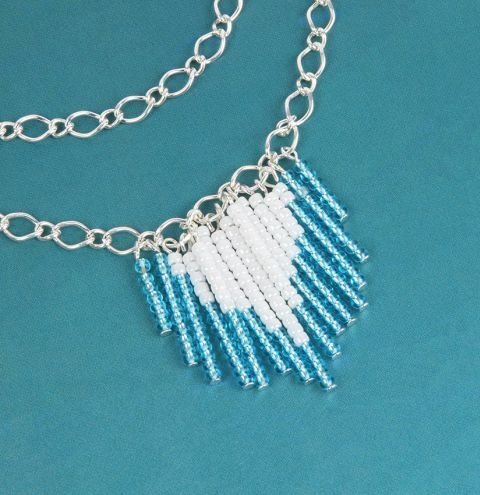 Make a sweet graduated seed bead necklace using headpins and a shining 'figaro' link chain. Cut your chain to the length you would like your necklace to be. You may have some more chain left to make a double layer necklace with a layer of chain hanging above your pendant. To create your graduated seed bead droplets, you will make two of each length apart from the longest one in the centre. For each pin, cut the top down to 1cm worth of wire. Bend the pin to 90 degrees and turn a loop. Watch this quick tutorial to learn how to turn a loop - HERE. In our design we used the following amounts on each headpin. This last pin will be positioned at the centre. Open the loops on the headpins and attach them across your chain. Find the central large link on your chain and attach the 3 middle pins with the longest at the centre and the next 2 on either side. Attach the next size pin to each of the smaller links on each side. Continue to add 3 pins into the next large link on either side. Continue to add all your pins onto your chain, making sure they hang correctly. Finish your necklace by attaching a jumpring to each end of your chain. At this point you can attach a second layer of chain to these jumprings so that it hangs an inch above your pendant. Finally attach a lobster clasp to one side of your necklace.